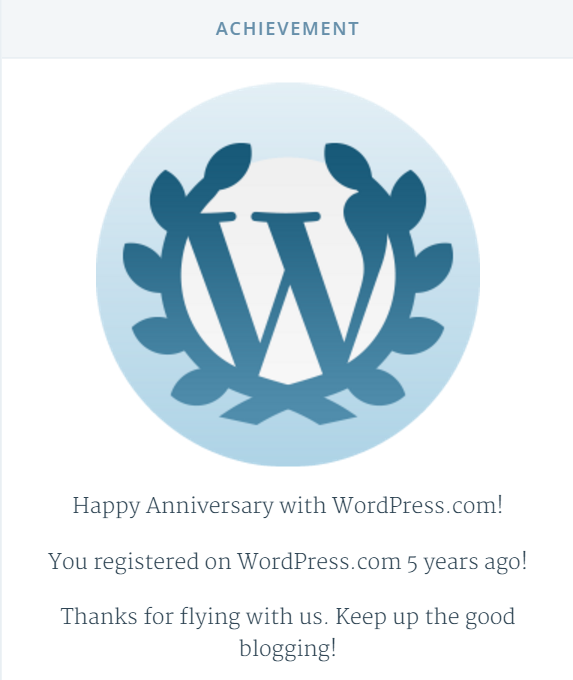 Five Years Of WordPress: A Celebration? It honestly doesn’t seem like that long ago… and of course it seems like forever. Of course I have been blogging for well over a decade, but I seem to remember sometime in 2010 when Cory Fowler started telling me I should migrate my blog from Community Server over to WordPress. I was pretty happy with what I had, but I trusted Cory and told him that if would help me to do the migration then I would do it. And so on November 2, 2010 he and I set a meeting to sit down at Artisano Bakery Cafe in Oakville, and as I watched on he did the heavy lifting… that is, he exported my old blog (a couple hundred articles deep at that point) and then created my new account here, on WordPress.com. There was a slight cost involved (as there still is to this day) so that my blog appears at www.garvis.ca (and www.virtualizationczar.com) instead of at garvis.wordpress.com. Remembering the advice I received from people wiser than myself (and that I have since passed on to many aspiring IT Pros) I needed to build and maintain my brand… a professional site should not be a redirect. I do not remember how many visitors I had in 2010 (combining the old site and the new one), but I think I was pretty happy at the end of 2011 to have welcomed nearly 26,500 visitors. Five years later and for the first time ever I am on pace to record 210,000 visitors for the year… and while that makes me happy, it does not make me satisfied. What really satisfies me is when people tell me that they have read my articles; when they have enjoyed the personal ones and grown or learned from the professional articles, that is what really makes me keep at it. Thank you for your continued readership. If you are a new reader, then I am glad you found it, and I hope you stick around. If there is something in particular that you would like for me to write then just ask… my blog is about me, but it is for you. I know that I sometimes fall behind in my writing… I know that so many of you were looking forward to a bunch of new posts once I got to Japan, and that didn’t happen… I wrote a few but have not published them yet. They are coming, I promise. One or two professional ones, along with one of two personal ones. Stay tuned, I promise I am back! ← Warning: The Tax Department Is Not This Efficient!